The January 1 theme for the City Daily Photo blogger community is "photo of the year" which can be your best or your favourite photo that you had posted over the past year. 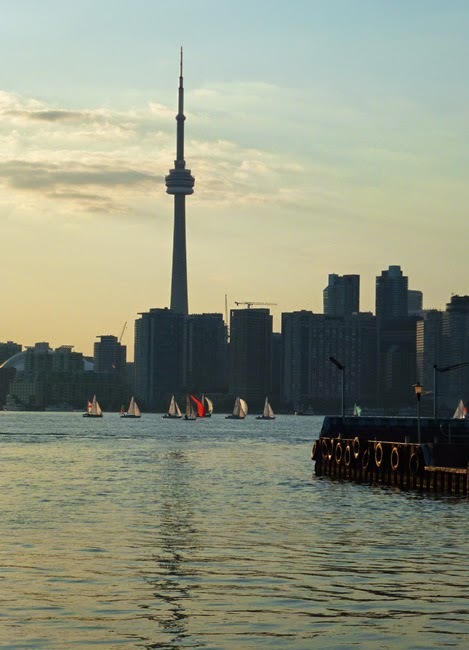 I chose this one of the Toronto skyline as seen from the Toronto Islands in summer since one of my favourite things is to take the ferry over to the Islands and wander around enjoying all the fabulous views and just relaxing away from all the traffic and construction in the city. I had originally posted this one for the July 1 theme day. To see more "Photos of The Year" from around the world, click HERE. Choosing just one among many, I"m thinking, would be a daunting task. This is such a great photo and the little splash of red in the center really pops out. Happy New Year! I believe I remember this shot. Wonderful! I love this iconic view of Toronto, RedPat! This is gorgeous Pat. Great choice. It's a very special photo, Pat! I would guess you had many to choose from. A very Happy, Healthy, Prosperous New Year to you and yours! It is lovely, RedPat. I like the way the sailboats provide the color in the photo. Looking forward to a happy 2015 for you! I like your photo. It is difficult to choose one ..
Great choice. Happy New Year from Spain! Happy New Year from Scotland! Love your choice - the red sail lifts the whole image. Great photo! Happy new year to you! I've been looking forward to seeing your choice Pat, it would have been hard, too many fab images but you made an excellent pick. Love the city skyline, with reflections in the fore. Wishing you a wonderful 2014. Great pick, and pic ;-) Happy New Year!! An excellent image! Happy New Year from Tuscany! I love the little pop of red from the sail. Good choice. A fine choice for the 'year in review'. Nice choice. I love that spot of red. The Tower is such a good photographic subject, and you've chosen beautifully with this shot. I'm sure there are exceptions but I tend to enjoy my travels and the view more from a ferry. Happy New Year from the Pacific Northwest U.S.! portrait of a wonderful city! Nice cityscape. If you see the CN tower it is a sure sign you are in Toronto. It's a great shot but that red sail just makes it! ROUGE!!! I like the silhouette of buildings ! !